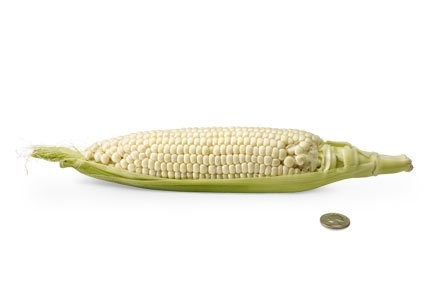 Size of Baby Boy: An ear of corn (The mango from last week looked bigger to me? I guess the corn is longer maybe.). BB2.0 is almost a foot long and weighs 1 1/3 lbs. His brain is growing quickly, his taste buds are further developing, and there is some fancy lung development happening this week. Exciting stuff. Weight Gain So Far: Omgggggg I'm going to have to take this category off soon because it is getting embarrassing. Per my official weigh-in at the doctor today, I am up 14 lbs. I didn't think 14 lbs was too shabby until I realized that I really only wanted to gain 20-25 lbs total this pregnancy, and I am currently closer to that than I want to be. Also I didn't think I was doing too badly until I looked back and saw that with Lilly I had apparently only gained 10.5 lbs at this point. How is that even possible? Seriously, two years ago I feel like I had to have been lying. I am not sure why the numbers seem to be increasing quickly right now, I haven't been eating much differently except for all of the Halloween candy. Also, I think there is something WAY wrong with our scale, because there was a 2-3-pound difference in gainage between when I left home and when I got to the doctor (and I didn't eat or drink anything in between...on purpose, ha). Perhaps I should try to stick to a veggies-only diet for the next 16 weeks? 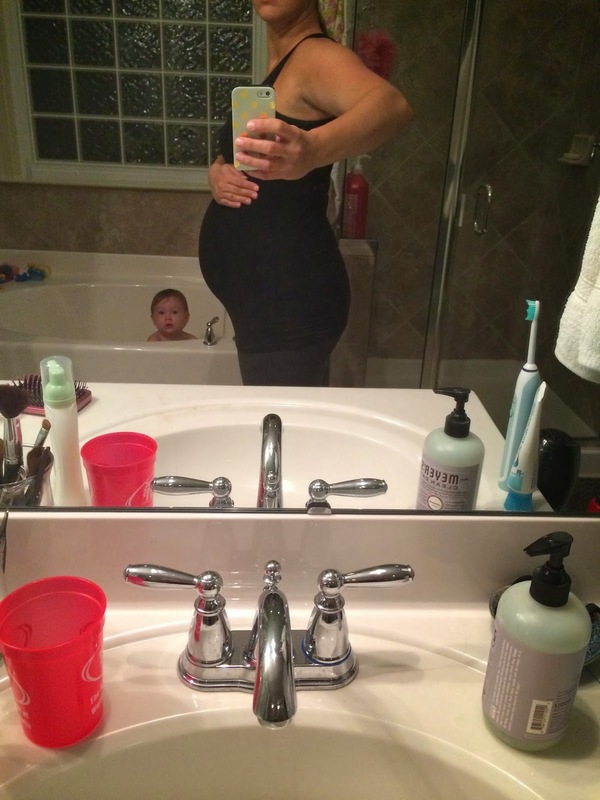 I seriously have been pregnant during the wrong (or right, I guess, depending on how you look at it) time of year both times around. How am I supposed to only gain 20-25 lbs when I am pregnant for Halloween (ugh the candy! ), Thanksgiving, Chick-Fil-A peppermint milkshakes in December (mouth already watering! ), Christmas and New Years?!?!!! Whatever! Cravings: Chili, which I satisfied on Monday. Aversions: Nothing that I can think of (except maybe vegetables? see above "weight gain" category HA). Symptoms: Same old. Tired, clogged pipes. Insomnia seems to be improving at least for the time being (knock on wood). And some cramping. Movement: Loving every second of it! He "ran" from the NP today when she was trying to find his heartbeat. Little stinker! What I Miss: Again, can't really think of anything here. 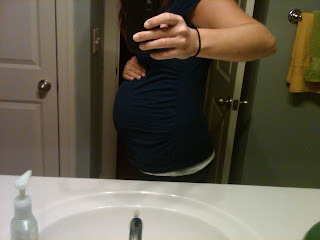 Signs of a Bump: Perhaps this is where those 14 lbs come into play. Laughing out loud at Lilly photo-bombing again. Also not sure why my armpits look weird here? I still feel like I look smaller this time around, which I think is part of the reason I'm so keyed up over the weight gain. It's actually probably not that I'm smaller, just maybe that everything is distributed differently? Who really knows. What I'm Thankful For: Another fun weekend at home. Miss Jane pointed out that we weren't actually "at home" all that much to have been at home, per se, but we had another wonderful weekend. That was the last one we have here for a while, and although we have some exciting things coming up I am also a little sad about it! Also, I'm thankful for a good report card at the doctor today (see below). What I'm Looking Forward To: Family time this weekend with Dan's family! Lots of fun activities planned, and I know Lilly will love seeing all of her cousins and meeting her new cousin Baby Dorothy. Doctor Appointment Update: I had an appointment with the Nurse Practitioner today (whom I LOVE), and it went great. She said that everything is fabulous and baby boy is perfect. Such great news! My official blood pressure was 122/76, can't get much more perfect than that. We discussed the fact that while my risks for having preeclampsia again are elevated, everything looks wonderful right now, so fingers crossed it stays that way. Hooray! Next Doctor Appointment: 4 weeks, November 19th. 4 weeks and counting to dread drinking the glucose drink that's currently camping out in my fridge. Eeek! Not as short of a post as I'd hoped, but I'll take it. Hope everyone's week got off to a great start!